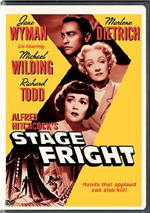 Hitchcock’s Stage Fright starts unconventionally, with a couple already on the run. We meet a young woman named Eve (Jane Wyman) and a man, another Hitchcock heavy named Johnny (Richard Todd). From here the story shifts immediately into an expository flashback. Johnny tells Eve that his paramour, local starlet Charlotte Inwood (Marlene Dietrich), showed up in a tizzy at his apartment earlier that day. Eve is certainly an earnest young woman, convinced that this man she apparently has some affection for (though it is never defined) could never have committed such a heinous crime. After bringing him to her parents’ house to hole up for a while, Eve decides she’ll do some investigating on her own, and heads over to Ms. Inwood’s residence to check things out for herself. She arrives to find a bunch of police activity out in front of the place, and among the fray is a handsome young man. She recognizes him as the same man she’d met in a pub the day before, a man named Smith. They’d had a mild flirtation there, but Smith didn’t tell her that he was a detective. Now that he’s on the Inwood case, he’s going to be looking for Johnny and trying to woo Eve all at once. Eve can’t let Smith find out where Johnny is, or she’ll be an accessory. She doesn’t want to tell the police and have Johnny arrested if she can prove that Inwood had motive and opportunity. She’ll need to get some evidence, though, and that will be difficult considering Johnny himself incinerated the bloody dress. Eve decides that using her acting skills, she’ll impersonate a maid and get into the Inwood flat to try to find something incriminating. While Charlotte certainly doesn’t seem crushed by the loss of her husband, Eve can’t find anything that would point to the murder. It appears that Johnny burned the best evidence they’d ever have. The only way to get Johnny out of trouble is to get Charlotte to confess to her crime and get the police to hear it. Of course, this will involve even more disguises and identities for the young actress Eve, a complex plan that involves her father (deftly played by Alistair Sim), blackmail, a blood stained doll, and a twist of an ending. From here, I’m going to discuss many parts of the plot that contain heavy spoiler material. If you don’t want to spoil the movie, please skip from here to the technical section. I’ve been struggling with what to write about this movie for quite some time now. One of the roadblocks is that it just isn’t a very complicated plot, so there isn’t a whole lot to explain. The wrongly accused man is a plot we’ve seen in far better Hitchcock films, but what separates Stage Fright is the big twist. It turns out that the entire basis of the narrative, Johnny’s flashback that starts the film, is a complete lie. Johnny is, in fact, guilty of killing Charlotte’s husband. Unfortunately, the film lollygags toward this supposed-to-be shocking finale, so by the time it rolls around, I had already checked out of the movie. The pace was just far too slow, and the characters less than gripping, so it really didn’t hit the heavy chord it wanted. As it developed into cinematic convention over the years since, the unreliable narrator is best revealed closer to the middle of the movie. It helps build suspense toward the end, to get the movie rolling toward the climax the viewer desires. Hitchcock regarded this twist, the avant-garde idea of the unreliable narrator in Stage Fright, as one of his greatest career mistakes. He saw the movie himself after it had been assembled, and knew it wasn’t going to work like he’d hoped. The lack of interest in any of the main characters only exacerbates the lackadaisical pace the movie follows. Eve isn’t exactly the most interesting of Hitchcock female characters, through no fault of Jane Wyman’s. She’s a cute young lady, but her character is sort of dopey, and her motivations are never really made sufficiently clear. Sure, she is avoiding using the police because she doesn’t want Johnny to get caught, but why? Is she in love with him? Do they go back a long way? Does she owe him something? Were they romantically involved at some point? Her involvement with Smith (Michael Wilding) is about as electrifying as wet newspaper, so the romantic arc with their characters feels like a cinematic obligation rather than the driving narrative force it should have been. The only remotely interesting an “Hitchy” feeling character is the Commodore. In fact, the film itself just doesn’t have that typical Hitchcock feeling to it, in almost any facet, at least not Hitchcock in the 50’s. This film fits better with his earlier career, before he hit his stride and was still really experimenting. How un-Hitchcock does Stage Fright feel? There’s a musical number in the middle of the movie that absolutely grinds it to a halt. Marlene Dietrich sings a Cole Porter numbercalled “Laziest Gal In Town” that, as a member of a much younger generation, reminded me too much of Madeline Kahn’s “I’m Tired” in Blazing Saddles, only less interesting. Hitchcock films it like he has no idea what to do with it, because this isn’t his strength. It comes off as some sort of contractual demand made by a true “Movie Starlet” rather than something that the usually tight-fisted Hitchcock wanted. Stage Fright, like I Confess, just isn’t that exciting of a film. Even its super-noirish ending, supposed to be white-knuckled and ultra tense, falls flat. Unlike I Confess, though, Stage Fright isn’t just a middling effort. This movie is just plain bad. It feels like a collection of ideas that Hitchcock tinkered with, trying to make them all fit together, but in the end realized just wouldn’t hold the story up. I can’t recommend Stage Fright as a film on pretty much any level. 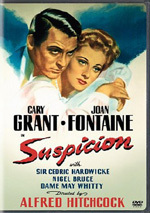 Stage Fright appears in an aspect ratio of 1.33:1 on this single-sided, double-layered DVD; due to those dimensions, the image has not been enhanced for 16X9 televisions. Of the four Hitchcock Signature Collection discs I’ve seen thus far, Stage Fright has the dubious honor of being the worst looking. Besides being expectedly grainy, the picture is littered with unacceptable errors. There’s a lot of vertical streaking, which is indicative of a negative scratch, and we aren’t talking about a couple of frames. There are several streaks that list upwards of thirty seconds, and one that ends the film running over a minute. At around the 28-minute mark, there are so many nicks and scratches that it actually appears to be raining. There’s even a skip right toward the finale. Stage Fright also suffers from a lot of shading inconsistencies that create a disturbingly vague picture, like the film’s ending in the prop basement. This film needs restoration badly. The audio isn’t much more exciting, or well executed, as Stage Fright is presented in monaural, which as usual limits its evaluative criteria to clarity alone. In that regard, it’s a serviceable track at its peak. There are a lot of analogue imperfections to deal with, as it presents the hissing and popping of a record player rather than the crisp clarity of digital. The mix is also a bit inconsistent, as the music - a bombastic Leighton Louis piece - occasionally overwhelms the dialogue, and is especially poppy during the “Laziest Gal in Town” number. It certainly seems that Warner was content to let these discs, as a set or individually, trade solely on the strength of the films, as there is no value added from a technical perspective. The bonus material is once again limited to the films three minute trailer and the run-of-the-mill, 19-minute historical featurette, Hitchcock and Stage Fright. Sadly, the featurette is somewhat bland in comparison to its set mates. It’s the usual suspects appearing again. Peter Bogdanovich, Richard Schickel, and Richard Franklin - who directed Psycho II - mine the movie for any material they can find. The most interesting parts of the featurette are the interviews with a present day Jane Wyman, who recalls how it was working on the set with Hitchcock. Given the amount of footage that features film cognoscenti discussing Hitch in retrospect, any time you can hear from someone who actually worked first-person with the man, it’s worth noting. 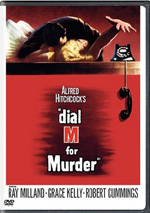 Beyond that, the featurette is highlighted by the confirmation that Hitch didn’t like the finished product, and Bogdanovich’s cursory mention of the mother portraits in many Hitchcock movies. It’d make a good film school paper, and probably has hundreds of times. In the body of every artist’s work, there will be failures; even Zeppelin did “All of My Love”. Hitchcock is no exception. Stage Fright has settled into the latter camp, in spite of a good cast and an interesting idea. The execution just isn’t what a suspense movie should be, and the result is a walkthrough of a film. The technical specs are terrible, and the bonus material is pedestrian.